“It is this man who pretend Nembutsu is the hell of the incessant suffering”. The clerk reproved Kagenobu who was excited. “Dear Tojo, we are discussing the territory problem here, are not discussing the Buddha's Law”. “If so, should you not do judgment in conformity with common sense as written on Formulary of Adjudications without being afraid of authority without hesitating to the public?". “If so, it is clear that our Seichoji Temple is guiltless. It is the fair judgment that a court confiscates the land of the land steward and gives to the Seichoji Temple as the punishment according to the Formularyof Adjudications to ban a reckless land steward who embezzles land without permission”. The Tojo side leaned forward this time. Kagenobu stood up, but he was stopped by the subordinate. Similarly, the Seichoji Temple side thought losing if they remained silent and they raised a voice and fought back. The government official quiets it, but both booing does not stop. The judge declared to stop it in a hurry. The priests and farmers gathered at the inn of Kamakura in the evening. Everybody crosses their arm, and they look anxious. Farmer told in whispered tones. "There may not be the winning chances with the state of the trial." "The other party is a samurai family. There will be the supporter of land steward, too. Ten to one, it will be defeat." Becomes pessimistic against the land steward. Farmers were depressed, but they noticed there were the people who were absorbed in talking in a ring in the corner of the room. The center of the ring was Nichiren. He grasps the Lotus Sutra with his hand. Jokenbo and Gijobo and others listen to instruction of Nichiren seriously. "Must not give up it. Even timidity is not good. Here is the time of the game. The partner is a samurai, but the righteous reason wins by all means. The tyranny of the land steward cannot be good for being permitted. Everybody, it is just a little more patience". Gijobo had a sparkle in his eye. Nichiren grasped the scroll of sutras and stood up. "We only pray afterward". If this Lotus Sutra has power, the wish should surely come true. It is the time to try the power of daimoku now”. Enchibo of the elder stood in the way there. "Nichiren, what a terrible cursing to the land steward! Seichoji Temple is extinction because of you. A devil is possessing you who say Nembutsu is hell. It is sure that the trial loses. Leave here early!”. Everyone was upset about words of Enchibo, but Nichiren was calming down. “Dear Enchibo. I have respected you since a boy. However, I just understood clearly. At your deathbed, you will fall into the bottom of the hell of incessant suffering more deeply than the scholar of Nembutsu”. 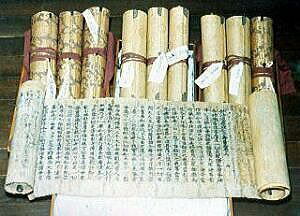 Nichiren upraised the scroll of sutras of the Lotus Sutra. “You must quickly reform your dwarfish mind and embrace the marvelous Law of Buddha”. Enchibo leaves without being able to answer. Several believers followed him. Nichiren sat in the balcony and has begun to intone to the moon of Heaven. Jokenbo and Gijobo sit down behind him and chant in chorus. And dozens of believers of the Seichoji Temple chanted it hard. The day of the end has come. The people of the Seichoji Temple watched the entrance of the court anxiously. The temple side and Kagenobu side were divided to the left and right at the hall of the trial and sat down. Everybody is tense. They are talking in whispers. On the other hand, there was Kagenobu with a satisfactory face. The judge appeared on the front before long. The room fell silent, and the clerk declared it. "Then we state judgment about the possession of the territory of the Seichoji Temple from now". The judge told it solemnly. The people of the temple grasped a hand each other this moment.There is the person pressing both hands. Kagenobu was a face dumbfounded in contrast. He said with an absent look. "Is it not some kind of mistakes not to receive the claim of the land steward?". The judge was tense and answered. "This is the judgment of the all members of our court". "What a piece of folly!". Kagenobu pointed his finger at the judge. "Still are you samurais? Why do you help the temple which seems being destroyed? What kind of intentions do you have?". "Lord Tojo, I may understand your mind. However, here is the place of trial. It becomes the territory confiscation if you tell curses here. You must know your situation well." Kagenobu does not calm down. “Stupid! Is it good as that such a thing is permitted? You has disgraced me. When it comes to this, I appeal to Governor or lord Kamakura”. The judge is not shaken. He serves the Shogunate, but is the executant of fair law at the same time. He told himself that he turned to the ceiling. "Formulary of Adjudications says. 1. We are not smart, and the thought is light, but we think straight and not think to twist it”. The clerk swore with the same posture. "1. We do not work for the profit of a particular person". The trial government official did the same. "1. We say that the right thing is right. We say that it is wrong if without a proof for something”. "1. We understand it that the person who remains silent about the right and wrong while knowing the detailed progress to hide a malicious conspiracy of a certain person will be criticized by later people. What do you think, Lord Kagenobu?”. It is right a just argument. Kagenobu stood like a bolt upright in the hall and left with a reproachfull gaze. His retainers follow and leave. The judge declared it last. Seichoji side raised a voice at the same time with the last declaration and gave vent to delight. People held shoulders each other. The beginning of court of the Kamakura Shogunate is from the own residence of Yoritomo Minamoto. Yoritomo prepared another entrance hall into the home and attached a sign board of the small "High Court of Law". It is the first court in Japan. The place of appealing was not established before this. The trial remained a tyranny by the court noble of Kyoto. It was epoch-making that Yoritomo established the place of the trial. However, it is not getting along. Yoritomo was enthusiastic to settle anything by himself, but people who have the appeals to count on him increase remarkably and come over from the whole country. Disgusted by the shouts and disputes exchanged within his compound, Yoritomo ordered the locomotion of the high court. The High Court of Law of Kamakura is a formal building. The entrance was crowded with a samurai and the farmers who have the petition. There was a hall facing the garden. There is the judge in the center, and a clerk of a law-court is on his side. Furthermore, the government official watching progress at behind waits. The court case of this times was held by letter at first. The defendant and plaintiff have a showdown each other by letter three times. Finally, a showdown was carried out in a court. Nichiren wrote tyranny of Kagenobu in the letter of the trial and appealed to the High Court of Law. The Court of Law hands this to Kagenobu. Kagenobu makes an explanation book and holds it out to the High Court of Law. The statement meant this. The High Court of Law hands this statement to the Seichoji temple side and lets them refute it. They performed this repetition to three times. It is the three appeals and three explanations. The High Court of Law performs only the examination of the letter. They do not check it in oneself even if they may be suspicious. If it is suspected, both the person who appealed and who was accused had to prove it by oneself. There is not the lawyer of the primary occupation like the court case of modern times. The High Court of Law called both sides last and let them make the oral proceedings and concluded a hearing. Nichiren was familiar with the law such as Formulary of Adjudications besides study of the Law of Buddha. He used every text and wrote the complaint and refuted the description of the land steward. On the other hand, Kagenobu intended going to pass it by force. He ruled over the fields of the Seichoji temple and was going to change the temple into the Nenbutsu sect. Therefore, he demanded support from Shigetoki Hojou of the consignatory (note) in aides of regent Tokiyori Hojou. Shigetoki is the strong believer of Nembutsu as the founder of Gokurakuji temple and was called Lord Gokurakuji. His influence power to the High Court of Law overwhelmed the Seichoji temple side. Three appeals and three explanations were over, and the day of the showdown came. Tojo Kagenobu appeared in the garden of the court. He is arrogant as ever. “I was made to wait. The trouble is reflected on my work for the worthless appeal. It is the cursed nuisance”. The executive officer put his hands on the floor. “Well, well! Lord Tojo, you came here specially. It was a tiring for you”. "Next, each one of the Seichoji temple”. Village headman, farmers, Gijobo, and Zhokenbo appeared. Finally, Dozenbo appeared weakly. The judge declares a start of the oral argument. “We judge from now on about the territory of the Seichoji temple”. Jokenbo of the Seichoji Temple appears before. “Originally the Seichoji temple is the Tendai sect. This is the historical temple existing before than the times of Lord Yoritomo. Kagenobu of the land steward is occupying it without permission, and it is outrageous to recapture our land. The Law of Buddha is going to become extinct now. We demand that we stop the offence of the land steward promptly”. People of the Seichoji temple side trembled in anger and stared at Kagenobu. The judge gives the Seichoji temple side an icy look. The village headman of the Seichoji glebe appeared. The village headman was startled and covered his mouth with hand. The judge caviled at his words. “A limited time is the commonplace means of master!”. Gijobo was going to stand up too, but the village headman stopped him. After all, are they not able to win against someone who doesn't listen to reason? Kagenobu was convinced of winning the case and he flashed his smile. The superiority is clear. The Judge nodded to Kagenobu. “This judgment will be day after tomorrow”. When the Judge was going to stand up, a voice broke out. That voice was of Nichiren. Post of the Kamakura Shogunate. It is the aide of the regent and is located in the situation of “the vice-regent” substantially. It is the beginning that Yasutoki Hojo appointed Tokifusa Hojou of the uncle in 1224. Because he signed the official document of the Shogunate by a joint signature with the regent, it was called the consignatory. A system to suppress the regent's monopolizing. The disturbance happened in the hometown of Nichiren of the whole area of the Seichoji temple in Awa country. Brutal samurais blockade the door front of the temple. Samurais and vassals got into the house of the farmer rudely and threw a rice-transplanting tool to outside. "It was decided that this land was territory of Kagenobu Tojo who is our land steward". Families of the farmer cry. Vassals stand on each corner of the large fields with long sword. The Tojo Kagenobu of the land steward sits down to a folding stool and is satisfied. He intended to occupy the fields of the Seichoji temple by military power at a stretch. In this times, the friction did not die out by the boundary between the land steward who was a chief administrator of the Kamakura Shogunate and the existing feudal lord. Yoritomo Minamoto who established the Kamakura Shogunate gives orders to control the tyranny of land steward many times. But it was accompanied by difficulty to stop the desire of a samurai awakened to power. Blinding sheets of rain poured into the roof tile of the Seichoji temple. Nun O'ama and Dozenbo, the other priests, a village headman, farmers are gathering to the temple. Everybody was tired from the frequent fight with Kagenobu, and people who gathered were not able to hide a resigned look. "It is the demand to hold out the territory of the Seichoji temple and Futama immediately"
“Stupid! It is land of ancestors.He should not have the authority to take away land even if he is the land steward”. "Nun O'ama. How is that we appeal to Kamakura. We who live in country do not have a method and can carry nothing out”. The attitude of O'ama is weak unusually unlike an aggressive voice of the believers of the Seichoji temple. "A lord of a manor is a government official of the Kamakura Shogunate. Even I cannot interfere in him”. The husband of O'ama is said to be Tomotoki who is the younger brother in Yasutoki Hojo. He was influential branch family of Hojo, but cannot intervene to the head family partitioning off the Shogunate". "Then, we cannot but swallow it, can we ?". Weak Dozenbo of the mind watches a complexion around and considers. "How is the method to appeal to Mt. Hiei for?". Young Jokenbo reproved the teacher immediately. "Teacher. Now is the world of the samurai family now. There is not it with the thing which comes true even if a priest protests them”. Enchibo of the elder persuades Dozenbo. “Lord Kagenobu does not say smashing this temple. It means that he manages the land of the temple while a little. We may cannot help receiving him contentedly if so”. Enchibo suggested compromise. Can they not win against a crying child and a violent lord? It was dark, and the all members were depressed. They heard a voice from the back at this time. "Please wait a little, everybody”. When everybody turned around, Nichiren who attached a dripping wet rain wear stood. Farmers stood up with pleasure unintentionally. "Oh, priest Nichiren! I am glad to see you”. Gijobo beats the shoulder of Nichiren a little. "How are the propagation activities of Kamakura? Is there not troubled matter?”. Nichiren was smiling unlike the air of the place. "I have a trouble with procurement of the daily food, but I am living thanks to the offering from a new believer somehow." Nichiren took off a rain outfit and sat with his legs bent. "I've heard the discussion well. How does the policy intend to make?”. Nichiren has begun to talk slowly after a time. "How about what we accuse at the High Court of Law?". “It is one of the duties of the Shogunate to supervise the tyranny of the land steward. If we, existing lord of a manor, appeal to the High Court of Law, it should be able to be settled”. Nun O'ama seems to be uneasy. "However, they are government officials of the Shogunate even if the High Court of Law. Is it expected that we win?". Nichiren stared at O'ama and talked. “As for this matter, we have justice. It is the land steward who have invaded the territory of the Seichoji temple. We can win if we appealed this to the front. In the first place there is not the method to protect the territory other than this”. One of the farmers muttered. "Must we go expressly to Kamakura?". Enchibo told Nichiren to look down. “It may be too optimistic that we appeal to the High Court of Law and win. The person good at a trial is not here. Besides, the trial takes money and time. What should we do when we lost? Nichiren, your thought might be light”. Nichiren looked around the believers of the Seichoji temple paying attention to him, and answered to them flatly. “I entered this temple in 12 years and trained myself. My parents received help from Nun O'ama, too. At any cost, I want to return your favor. What does everyone think about this?”. All members were lost in thought, but the farmer who went to the thatched hut of Nichiren spoke with a thick tongue. "We should appeal. It is the yes-men of the land steward all the time if we gave it up here”. The headman of village has begun to play along, too. Dead leaves fell into the road, there was the autumn sign.Nichiren preached the faiths of the Lotus Sutra and the error of other denominations patiently to people visiting the thatched hut of the Matsuba Valley. There was not the street preach of Nichiren handed down as far as we read his writings in fact.He performed basics of the propagation in the environment that could tell calmly in the thatched hut even if he talk by chance at the roadside, and there was sometimes a question of doctrine from audience, he praised the will of the questioner and preached while discussing it. 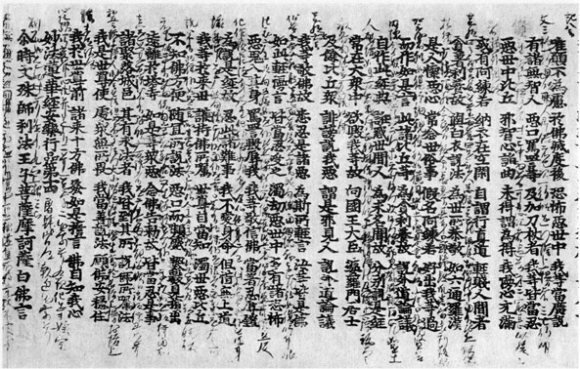 The first personal letter which Nichiren sent to Toki Jonin of the believer of the same country on December 9 at the end of 1253 when he declared the establishment the denomination is still left. “I am pleased you send a person to pick up me.Because there is a public attention if the daytime I want to meet you at night. I hope that you pick up me at the time of Bird (about 18:00) of the evening. Or it is good even if you come here and talk about the doctrine. The preaching on the street is showy visually, but there are few effects. A politician grasps a microphone in a street, but the audience watches only style and the face of favorite politician and does not almost hear the speech. Shakyamuni Buddha preaches either basically at the temple (e.g., Venubana Monastery [note]in Magadha ) given by King and the powerful family. It snows in Kamakura Hachiman shrine. Samurais and people of town walking this front put hands together towards the Shrine. The Kamakura Hachiman Shrine is called Hachimangu Shrine either. This is what Yoriyoshi Minamoto-no of the Kawachi Genji second generation prays for an advent of God and invited from Iwashimizu Hachiman Shrine of Gokokuji Temple of Kyoto in 1063 and built. This is the beginning. Since then it was worshiped as a guardian deity of samurai Genji. Therefore, the person who walked in front of Hachiman shrine put hands together by all means. Powdery snow came fluttering into the thatched hut of the Matsuba Valley of Nichiren. Nichiren continued the sermon of the Lotus Sutra to audience patiently without changing in a thatched hut while feeling passage of time in the change of the season. Time passed, and the third spring came from the five year of Kencho era (1253) when he declared establishing the denomination. As for the name of an era, it was changed an era with the Kogen era on October 5 of Kencho era. Cherry blossomed on both sides of the Dankazura (note) of the Wakamiya thoroughfare, and the people of Kamakura were rife in joy of the spring. A butterfly flies from a flower to a flower elegantly outside the thatched hut. The name of Nichiren gradually spread in Kamakura. The follower who believes Nichiren and chants Nam-myoho-renge -kyo appeared one after another individually. The samurai either was in the audience gathering in a thatched hut. Nichiren took hand the scroll of the Lotus Sutra as always and has begun to talk. "The Fugen sutra says,‘the large number of people's sin seems a frost or a dew. The sun of the wisdom deletes these positively and removes it'. In other words, the sins of the past world are meanings to disappear if we believe Law of right Buddha”. The young samurai shut the talk of Nichiren suddenly. He will be still in his twenties. The young man furrowed his brow. “The now story, I cannot agree. A human being is a person living in sinful daily life. Besides we samurai is people who do not mind the killing either. Why may Buddha save us who are sinful?”. Nichiren has a smile, and answers. "It is a really good question. At first before solving this question, we must think why we were born in this world. The all creatures of the latter day of the Law are rotating in six paths of hell, hungry spirit, animals, Asura, a human, a heaven. If a person has a opportunity, a wish comes true he will be filled with rapture, and he will fall into the hell if he was blamed by a lord and incurred a anger. Sometimes a person is angry and sometimes grieves and sometimes flatters like a beast to a noble person and looks down upon a lower person. If a person repeats this, he cannot spend the present in peace, and the posterity would not be born to the good place. To that end, you must enter into the road of Buddha”. “Hum, then what does the person who does not believe Buddha stake his life on?”. Nichiren spoke to the samurai to persuade him. "A man abandons life for shame, a woman abandons life for a man. In addition, because the fish wants to hold life dear it lives in the pond, grieved to the pond being shallow, digs the hole and lives in the bottom of the pond. However, it is cheated to bait and is caught in a fishhook. The bird lives up the tree. If a tree is low, it lives on high twigs for fear of what is aimed at by an enemy. However, it is cheated to bait and is caught in a net. The human being is same, too. It is difficult to be born as a person, and to throw away life to the road of most important Buddha even if one loses the body and life for slight and worthless purpose in this world. That is why there is not the person becoming Buddha". The persuaded samurai gets angry at Nichiren and argues. “This is ridiculous! It is the duty that the samurai keeps his land strictly until he dies, to protect the whole families and a subordinate. That's the samurai. It is a awful insult that you say 'caught in the bait'. Please withdraw it!”. The samurai who was watching these exchanges talked to the young samurai. He is somewhat elegant and has a calm tone. “Excuse me, this is the precious place asking about sermon. Good medicine tastes bitter, good advice seldom welcome.Is it not the samurai to hear in calm mind even if different from your thought?”. The young samurai was excited more. “What are you saying? You are an outstanding simpleton to make admonition to me. I am very Yorimoto of Nakatsukasa Saemon-no-jo, third-ranked officer of the Left Division of Outer Palace Guards, of Mitsutoki Hojo's vassal and the person calls me Shijo Kingo (note).As for the person who does not know me, nobody is in this Kamakura. “I am Toki jonin, am the vassal of Chiba-no-Suke in Shimousa country. I became the believer of the priest Nichiren four years ago in the relationship of the same province. There was business at Kamakura today, and fortunately I was able to come to the place of the Law of the priest. Here, Shijo Kingo. Here is the place without the difference of a samurai and a farmer. The social position may not matter to ask the Law of Buddha. How do you think?”. It is a just argument. Shijo Kingo entrusted his force and raised a voice, but was at a loss for an answer. He blushed and stood up. "I have business. I'm going now”. Nichiren did not stop Kingo forcibly. "He would come to this thatched hut soon by all means," he told disciples. Then Nichiren noticed that the farmer dressed of the trip stood at the exit that Shijo Kingo left. He looks exhausted by a journey. He is a familiar face. He was a farmer of the Seichoji temple of Awa. He found Nichiren and he was relieved and sat down on a dirt floor. "Priest, please help Seichoji temple …"
Venubana means a bamboo forest. The first temple which existed in the Palace Castle in Mgadha nation (current Rajagrha in Bihar State) in middle India. Originally this was the garden of the bamboo which Rich Karandha owned, but was offered as the garden of the Buddhist priest because Rich was converted to Buddha. 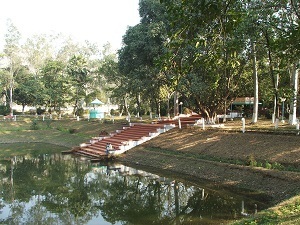 "The pond of Karandha" is there. It is written, "Buddha often preached the Law near that pond" in "The Great Tang Dynasty Records of the Western Regions". It was found by the investigation of the India Government Archaeology Bureau and excavated, and it was confirmed that there was Venubana monastery in this place. 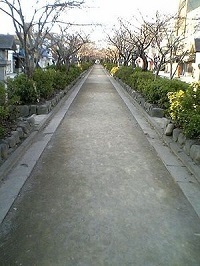 The road that is in Hachimangu Shrine and Wakamiya thoroughfares of Kamakura in Kanagawa Prefecture. The sidewalk which is one step higher than roads from the second gate to Hachimangu Shrine. The third gate is at the last arrival point and leads to the precincts of Hachimangu Shrine. He was born in 1230. Nichigan-nyo of his wife is recognized to have been born in 1243 from the description of "the 33 years old evil" in "Reply to the Wife of Shijo Kingo." In addition, mother of Shijo Kingo is said to be the daughter of the Ikegami family. Nichiren attacked the Zen Buddhism at the same time. He vividly writes down the figure of the then Zen priest by "'the Question and Answer of Saint and the Foolish Person" that he made a writing in 1268. It is said that the Zen priest cannot communicate in a language. The Zen Buddhism is not that awful in the present times, but the teachings are not changed than old time. The contents of teachings share the same roots. Zen sect also denied all the sutras same as the Nembutsu.The Zen sect says that Buddha gave the essence of the Buddhism to only Mahakashyapa (note) of the disciple of Buddha orally, not by a sutra. Therefore, they say that a text of a sutra does not have the truth, is useless to learn. “To transmit separately from teachings” means this. The persons to tell this hidden doctrine are Zen priests beginning with priest Dharma. Nichiren impeaches them with anger. Nichiren says that the person who causes slight faiths and entered the road of Buddha become a pest devouring the expense of the country. Therefore, when Zen Buddhism happened, the people who easily shaved their hair for becoming the priest appeared one after another. The person who does not have the judgment without having no knowledge, and training himself behaves like a learned and virtuous priest. Becomes arrogant not to speak of such a human being. There is not even the common sense like being pointed out by Nichiren. “The Zen sect today generally violates the five constant virtues of benevolence, righteousness, propriety, wisdom, and faith. To honor the high person of virtue, to respect the elderly, and to love infant are recognized in the Law of Buddhist and non-Buddhist's precept. However, the Zen priests are no more than the uneducated clowns or barbarians, and unable to distinguish black from white, until yesterday or the day before. Now that they have donned priestly robes, they have become so conceited that they belittle the learned and virtuous priests of the Tendai and Shingon sects, observe none of the courtesy and hope they rank higher than all others. These people are arrogant and inferior to an animal. Great Teacher Dengyo says in the explanatory note. 'The otter shows a homage to an ancestor by offering up the fish it has caught, the crow in the forest gives food to its parents and grandparents. The dove perches under than three branches from its parents, wild goose flies without disarranging the lines formed, and lambs kneel to drink mother's milk'. He asks: even lowly animals conduct themselves with such propriety, why can human beings be lacking in courtesy? Above is summary. It is natural that the Zen priests are confused about Buddhism doctrine. They do not even know the morals of human beings. Is this not conduct of the devil or monster?" ‘Letter to Niike’. There is a legend that the otter displays the fish which they caught for New Year holidays carefully and worships ancestors. The crow living in the forest carries bait so that the parent and the grandparents who brought themselves up do not starve and repays a love. It is said that the dove perches on the branch under three than a parent bird. It is well known that a wild goose does not break a line. The child of the sheep lowers the head at mother and swallows up the milk. They follow etiquette, and even an animal is dutiful to its parents in this way. Nichiren said that it was lower than a beast to exclude this. Then why did Zen spread in this time? The reason is quite clear. This was because powers-that-be believed. The powers-that-be is regent Tokiyori Hojo. It may be said that Tokiyori was the emperor who already ruled over Japan. Both the real Emperor and the commander-in-chief of the expeditionary force existed, but it was only Tokiyori that samurais prostrated themselves. He invited Doryu Rankei of the Zen priest from Soong. Nichiren is 25-year-old times. Tokiyori founds Kenchoji Temple in 1253 seven years later and invites Doryu. Nichiren do declaration to establish the denomination in Awa in the same year. Furthermore, Tokiyori became the lay priest three years later and was given the Buddhist name with Dosu-Kakuryobo. It is such the considerable adoration. The person according to Tokiyori made Zen meditation one after another. The fame of Doryu became high tempted by this, too, but Nichiren saw through him. “I, Nichiren knows this and often says the mistake of both priest and common person of Japan, this is the present evil, but becomes good fortune of the posterity. But the priest and common person of Japan know his behavior, they respect him for fear of authority and seem to neglect him at their mind”. 'Letter to the lay priest of Yagenta'. Although it was said that the Zen Buddhism has spread out among samurais, it was such a condition in fact. Nichiren who lived in the same times says more. “As for breaking the manners and religious precepts of Kenchoji and Engakuji Temple, a big mountain seems to collapse, and the wildness of their behavior resembles a monkey. It is fruitless to think being helped to the future and give an offering for them”. ‘Letter to Niike’. Tokiyori built Kenchoji Temple, and Tokimune of the son built Enkakuji. Although both temples exist now, Nichiren declares that is silly to think being born to the good place in next life, and hold the service for the both temples. Also, known as Kāshyapa. A son of Nikuridha of Rich Person. One of the major ten disciples of Shakyamuni Buddha, he was known as the foremost in ascetic practices. At the assembling seat in ‘the 6th Chapter, Bestowal of Mark' of the Lotus Sutra, he received a prophecy of Tathagata of Light. After passing away of Shakyamuni Buddha, he received protection of Ajatashatru and became the chairperson of the people who is collecting Buddhist sutras. And he gathered up sutras with more than 500 arhats at the Cave of Seven Leaves of the south in the Royal Palace Castle of Magadha country while more than a half year. In addition, he spread Hinayana as the first successors of the Buddha Law for 20 years. From 767 to 822. It is Saicho who became the initiator of the Japanese Tendai sect early in the Heian era. He became a priest at 12 years old and received complete commandments in Todaiji Temple in AD 785, and although he came back to the hometown once, he entered Mt. Hiei afterwards and built the thatched hut and mastered the Buddhist sutras and theory. He named the thatched hut as Enryakuji Temple in 788 years and again he changed this name to the Temple of both Concentration and Insight to One Law in 793 years. He contended the superiority and inferiority of more than ten denomination and doctrine such as Avatamska sect, Law Surface sect, the Three Logical sect, in Takao Temple in AD 802. He visited Tang in 804 years and learned the doctrines of Tendai, Zen and Shingon and the next year he went back to Japan and established the Tendai sect in 806 years. He became the priest protecting the Emperor Saga in 813 years and continued an effort of the Mahayana Sanctuary realization that the old Buddhist sects object to. The Imperial permission of the Mahayana Sanctuary was granted on June 11 of the seventh day after he died. Nichiren Daishonin appreciated this Mahayana Sanctuary highly. Daishonin praises him. "He united all the people of the Law of Buddha into one Law. This mind is surpassing Nagarjuna and Vasubandhu and seems superior to Nanyueh and Tientai.” (Selection of Time) . His disciple is Gishin, Encho, Zikaku. His book is three volumes of "Excellent Phrases of the Lotus Sutra", three volumes of "Article to Express Religious Precepts", a majority including "The Regulations for Students of the Mountain School".